I always find if your buying a gravity gun (or any gun actually) for example make sure its one with a Air regulation knob/valve on the gun, seems to assist in getting air to paint right for me anyway. 2K seems to be a pit picky on the amount of air and if its wrong well its a bit of rubbing down you have to do thats for sure LOL. Great thread and dangerously inspirational for me i think!!! I'm gonna be at home now thinking i'm you (and not even close!) but i'll be making a terrible mess of the neighbour's cars!!Ha! Seriously though, good work and its nice to get a look into the whole process. This may be a stupid question but are most of the materials available at motor factors or are they from specialist automotive paint shops? Great thread, finished item looks fantastic. Looks like a long lasting job as well, with the prep that went into it. I`ve seen some of those £3-400 full paint jobs and believe me you can see how they stay in business, its usually just a blow over with little or no prep and you can have red, white, blue or a delicate shade of f*ck off. Rust usually starts blebbing through again in a month. Fine for an old Transit that you want to make presentable enough to go and do some window fitting in but its not suited for something youre gonna try and take a pride in. Really good write up AK, very useful! That silver one looked beautiful, and the Estate was pretty darn cool too.... You've had some nice old Vauxhalls! more advice - the right kit makes the job better and isn't always the most expensive. The compressor is the frightening expense, mine was £550 by the time I'd paid VAT, delivery and a water trap. But its been happy squeezing air for me for 12 - 13 years... You could get cheaper even then but I was taken by this one being a proper pro one. It'll last decades. You need a compressor, a good water trap and a decent gun. Thats it. My eBay cheapy was fine until I killed it with 2K on a hot, humid day... I'll get another one soon for the next job. I like to keep one gun for one type of paint - so enamel or chassis black goes in one, cellulose in another, etc. Mixing seems to cause issues. A water trap can cost £10 - £100. In fact if you buy a proper dryer you can spend thousands... IIRC mine was about £35 plus VAT in the early 90s. They also stock W&D, masking tape, masking paper, sanding blocks, mixing cups and a million other useful things. Mine is staffed by ex-sprayers who value their lungs so now sell it rather than apply it, and are full of useful advice. This is why I prefer to use my local. For anyone in Notts, thats Paint Shop Supplies on Little Tennis Street, Colwick. If you want to go mail order Huggs Paint and Auto Paint of St Helens both sell on eBay and mail order and come recommended to me by others. paint can cost anything from £7 to £700 a litre. Brands like Lechler give a good quality product at a reasonable price. Not the lowest but fairly low. Going for real cheap stuff can lead to problems and bad colour match. ICI do a good range at good prices too. When I dod the Ventora in Rio Verde mica it was about £35 +VAT a litre Lechler HS Basecoat. I understand that the new UHS basecoats and WB Basecoats are more expensive, but cover even better so you use less. Don't get excited thinking you need HVLP either. It uses more air (works the compressor harder and canlead to atomisation problems if your compressor isn't up to it) and the finish isn;t actually as good as with a good od school High Pressur egun, however everyone in the trade use HVLP because it means less overspray (less wasted paint and therefor better proffit) also for environmental reasons. If you spray one car every blue moon neither is a big deal. The cheapo eBay one I used was claiming to be HVLP but I don't think it really was based on its air consumption. 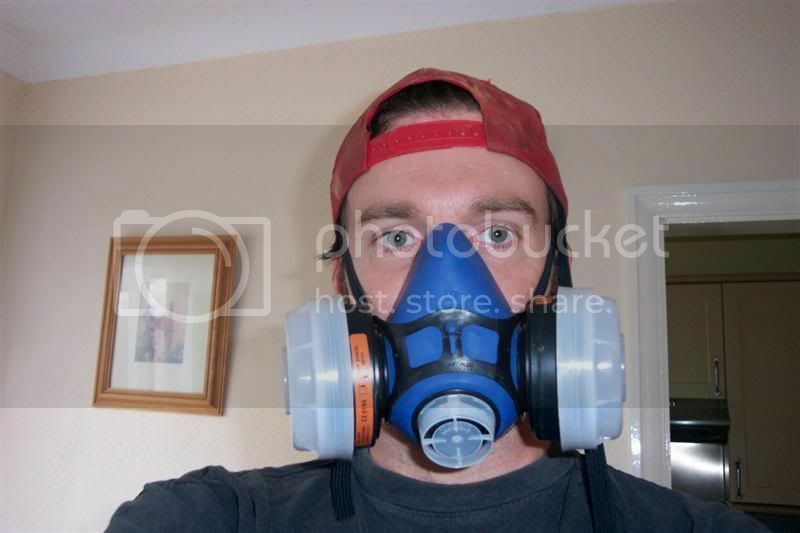 Wear appropriate spray safety equipment. I have some goggles to go on yet. Hat is to keep paint out of my hair and hair out of my eyes. Also so that “mates” can take the photo and turn you into an Altern8 gimp and post it on the internet. I'd forgotten about that, Sorry Al! And of course Slipknot. How could I forget. there was an animated one of me scuba diving or somesuch as well. Funny guys. Very nice write up AK. I'll be ripping all the pointers out and making a single PDF of that lot for future reference. Having only done small items before with success, I'd love to takle a whole car. great stuff AK i was going to add some pointers but you pretty much covered the lot and only echo what you said about paint quality the better quality ( not always the dearest) paint give the better finish and it will last better the estate is done in PPG i found theire custom colours more vibrant than alot of the more basic versions. I'd love to hear your pointers, especially for the basics as you do so much panelwork and yet it all looks die-straight. got to get the basics right or the rest of its wasted effort. The "knacker lacquer" paint job on the estate - is that this "truck coat" synthetic enamel you see on ebay? Basically it's like old fashioned coach paint. yes, thinned with cellulose thinners. Love those nuggets of advice there nightmares, summed a lot up for me there, you have to want to do it and do the learning, it won't be perfect, first few years will be less than perfect, and learning exercises. Then you keep learning, modifying and changing. One quick buying question? 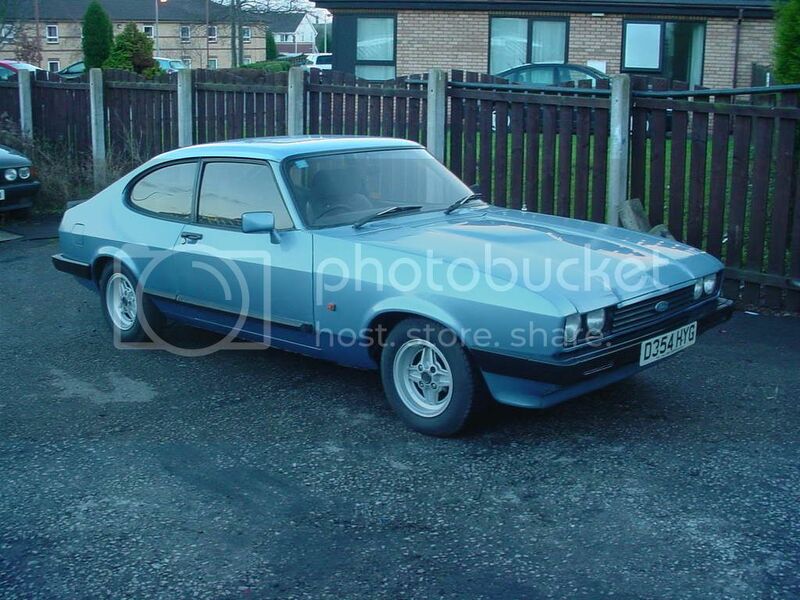 so say i wanted a full respray in say Ford China Blue, would there be multiple companies/manufacturers offering this shade, either off the peg or to custom mix for me? or will i have to go to one company who produces it. or always just select good brands and choose their colours? Ford China Blue should be Ford China Blue whether you buy it from ICI, PPG, DuPont, Max Meyer, API, etc. A match is only as good as the guy operating the mixing machine though. One local company (now deceased) mixed me some grey that was green it was that far off. You can get slight tonal and finish differences if you use different materials such as 2pack winfg on a car you apinted in celly, but other than that so long as the mathc is right you are OK.
A word of warning is that the older celly colours have a lot more variation in them as there was no ISO for paint colour back then, so a 1960s BMC blue might vary a bit if its celly from brand to brand. I'll eventually pick summat custom ish anyway. Amazing thread! Truely inspiring, Wish I had a garage. Thinking about renting a lock up! Sierra - here we go again! He has an illness, it's not his fault. you'll need a power supply to run the compressor... Plus something to keep the local kids away!